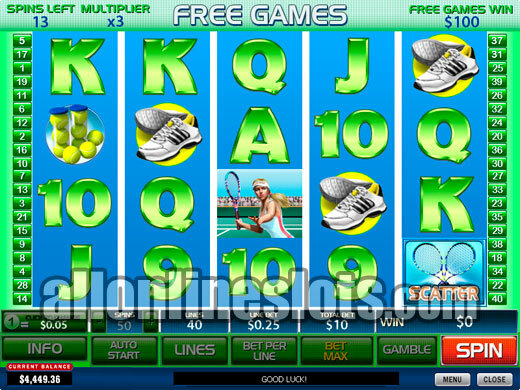 Tennis Stars is a 40 line video slot from Playtech with as your would expect a tennis theme. The game has a great animated bonus stage as well as free spins with all wins multiplied by three. It also has a red / black double up option. Tennis Stars is a Playtech video slot with 40 lines. It uses a 4x5 reel layout which is far less common as the 3x5 layout. As you would expect the game has a tennis theme which should be popular as tennis is a very popular sport to both play and watch. Max bet on Tennis Stars is 200 coins per spin or 5 coins per line. The game has a wide range of coin sizes to choose from starting at 0.05 and going as high as 1.00. This gives you a max bet range of between 10.00 and a big 200.00 per spin. We would have liked to see a 0.01 coin size but you can play less than max bet if 10.00 per spin is too high. The Wild Trophy symbols substitutes for all other symbols except the scattered Racquets. The wilds only appear on the middle three reels so there is no way to get five wilds. As well as substituting the wilds also activate the free spins. In terms of line wins, the top award on Tennis Stars is 5,000 coins. There are actually two ways to hit this jackpot with either five men or woman awarding 5,000 coins or 25,000 coins if you are playing 5 coins per line. After this the second highest line win is 1,000 coins which can be hit with either five shoes or ball symbols. As we mentioned above the Wild Trophy symbols are your ticket to the free games. Get all three on the screen at the same time and you win 10X your total bet and 15 free spins with all wins tripled. The free games can be re-triggered an unlimited amount of time and the top jackpot at max bet grows to a big 75,000 coins. Tennis Stars has a second bonus game that really makes good use of the theme. To win the Championship Bonus you need to get three, four or five of the scattered Racquets anywhere on the screen. You then move on to an animated bonus stage where you can win up to 250X your total bet or 50,000 coins at max bet. The bonus starts off with you selecting whether to play a Mens Singles or Woman's Singles (Preview). Once selected you move on to the match where you can choose from a range of shot styles (Preview). Your total bonus win is based on the score of the game with any Ace served adding another multiplier up to a X5 multiplier. As well as all of the ways to win on the reels you can also try your luck at doubling up your wins with a Red or Black gamble feature. It would have been great if Playtech had made the gamble feature tennis related as well but this is a minor negative. 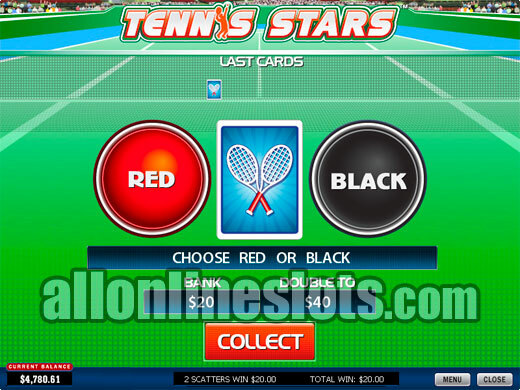 In the end, Tennis Stars is a great sport theme slot with a lot of different ways to win and quite a high hit rate due to the 4x5 reel layout and 40 pay lines. If you're a tennis fan then it's a must play. If you're not it is still well worth a look.